On the week that Bar None Records reissued both Crazy Rhythms and The Good Earth, the Feelies played a weekend of shows in the New York area. On Friday, they played Crazy Rhythms from start to finish at All Tomorrow’s Parties (acidjack’s recording is here). Saturday’s show was a performance at the beautiful Bearsville Theatre in Woodstock. Last night, the celebratory weekend was completed with an absolutely monumental Feelies show at Southpaw. The band performed two sets that consisted of over two hours of music, but the most amazing aspect of the show was the encore set — the band returned on five separate occasions to perform a total of ten encores. 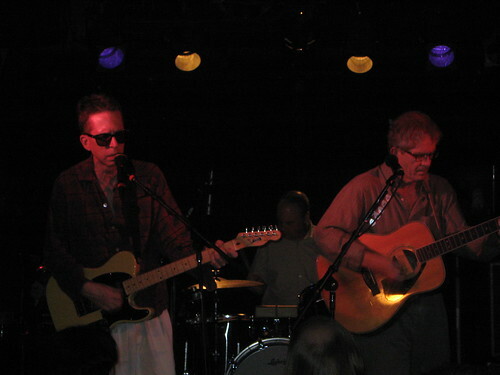 Included in the show were the usual plethora of covers — the raging second set opener of Neil Young’s “Barstool Blues” and the Beatles “Everybody’s Got Something to Hide” (from Crazy Rhythms) among them — but there were also a few surprises including a teacher-mimics-student version of R.E.M.’s “Carnival of Sorts”. The band was again well-served by the presence of long time sound pro Andy Peters, who navigated through a limited sound system to provide outstanding listening quality. We set up the four mics at the front of the railing above the floor which provided a direct line to the stacks. The resulting sound quality of this recording is quite excellent. Enjoy! 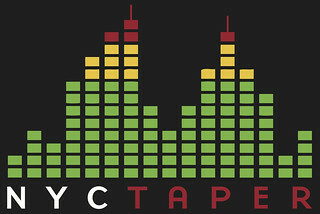 If you email nyctaper for access to this recording, we expect that you will PLEASE SUPPORT The Feelies, visit their MySpace page, and purchase the new reissues of Crazy Rhythms and The Good Earth directly from the Bar None website [HERE]. An incredible show, though to be honest I only made it through four of the five encores. The sound was great from where I was, about ten feet from nyctaper, so I’m really looking forward to hearing this. an absolutely brilliant gig! the [new song] (Set 1, song 3) was listed as Bluer Skies on the setlist at the Whitney concert in July. I have to admit that I am disappointed that you went with taping yet another Feelies set when you could have gone with Naked Raygun at Maxwell’s. Nothing against the Feelies, who I’m sure were great as always, but NR haven’t played the East Coast in something like 15 years! They were fantastic in Philly this past Thursday and it would have been great to have a NYCTaper recording to commemorate a quick tour that I suspect is not going to happen again soon (singer Jeff Pezzati is suffering from Parkinson’s). Well, I bought a ticket for Naked Raygun, which I ultimately had to eat. If they had replied at all to emails requesting permission, I would have arranged to have covered both. Thanks for these tapings, the show was absolutely massive. I saw them in Woodstock as well, exactly the same setlist with the exception of Everybody Got Something To Hide. Great sound, great songs. THANK YOU! Glad to hear the Crazy Rhythms ATP set it forthcoming as well! Thanks from an old fan in France. Thank you very much for all your efforts! Was it just me or did Glenn Mercer seem a bit edgy? ?